TEDxSPSU was held on March 12, 2011 at Sir Padampat Singhania University, Udaipur, India, with the theme Order from Chaos. This series of posts are what my TEDx presentation was based on. There are six parts that shall be published sequentially over the next few days. This is Part Four. What doesn’t help is that we live in one of the most diverse nations in the world. We have 200 million school going children, over 16 mn higher education students (expected to touch 40 mn in 2020), 35 geographical and ethnic units, 22 official languages, 1.25 mn schools, about 500 universities, over 26,000 colleges and over 6 million teachers in an area spanning over 3 million square kilometres. 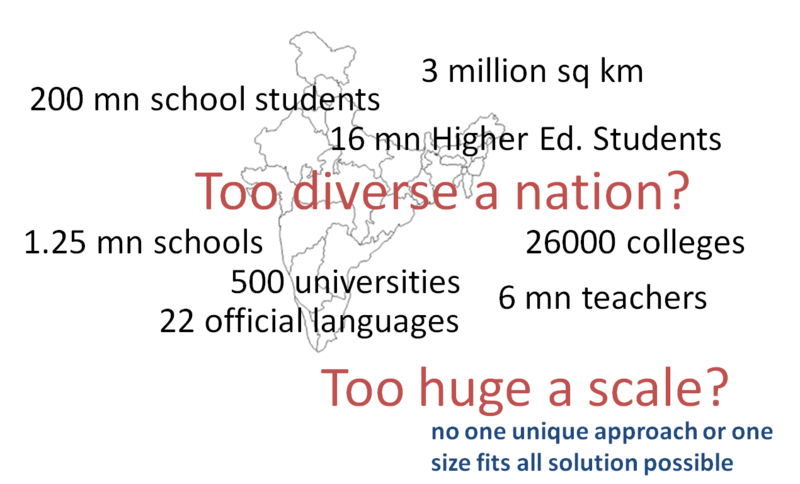 We have a huge scale with no one unique approach or one size fits all solution possible. But what we are really saying is that we want ORDER. Order implies design and organization of systems and structures with predictable outputs. We have created boards of education, district, state & national level hierarchies, and many other superstructures that include accreditation and degree granting bodies. On top of that we have unifying national policies and curricular frameworks. All working on the principle of centralized direction. And when this order fails, we add even more Order. And at any cost. It’s a pity that the largest education companies are built on standardizing content and assessments not enriching experience. It’s a pity that education technology today means Learning or Assessment Management Systems and page turning multimedia content in classrooms. It’s a pity that we are increasing the power and quantity of superstructures to govern education. Not surprisingly, our conception of educational systems as being orderly embraces some vast over-simplifications. We conceive of stereotypes of students, teachers, educational environments, learning processes and hammer out a unifying certification and assessment system that actually drives all learning and teaching. These oversimplifications, on a lighter note, result in some fantastic vision statements. Here is one that envisions the Engineer of 2020 crafted by the National Academy of Engineering in the US. 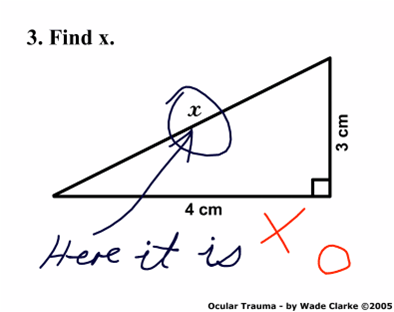 Why do we make such assumptions and over-simplifications? Perhaps the most important reason is scale. We feel we can hammer predictability in the face of scale by making orderly processes and structures. And order is our typical solution. TEDxSPSU was held on March 12, 2011 at Sir Padampat Singhania University, Udaipur, India, with the theme Order from Chaos. This series of posts are what my TEDx presentation was based on. There are six parts that shall be published sequentially over the next few days. This is Part Three. 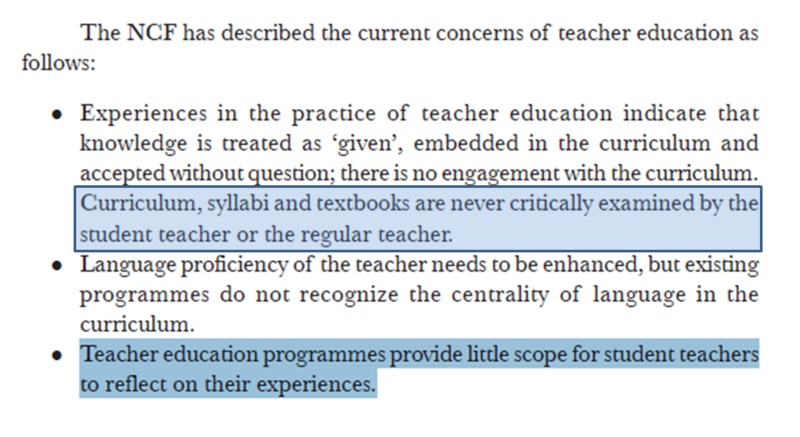 On the other side, in teacher education, there is a really funny contradiction that I recently came across in teacher education. The MHRD talks about in its annual reports setting up of about 600 District Institutes of Educational Technology covering the whole of India, one for each district. The DIETs, as they are unfortunately abbreviated, are responsible for improving the quality of basic education and increasing enrolment as well as retention. They are supposed to mentor teachers in the District and supervise educational schemes. 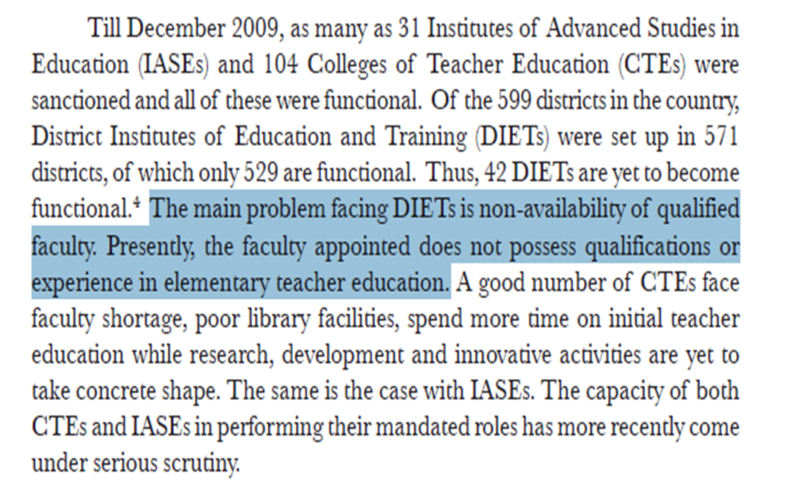 However the National Commission for Teacher Education on the other hand bemoans the fact that they do not have enough qualified teacher trainers to staff these DIETs! Not only are we burning our children at the altar of this education, but our teachers-to-be are going through no different a process! 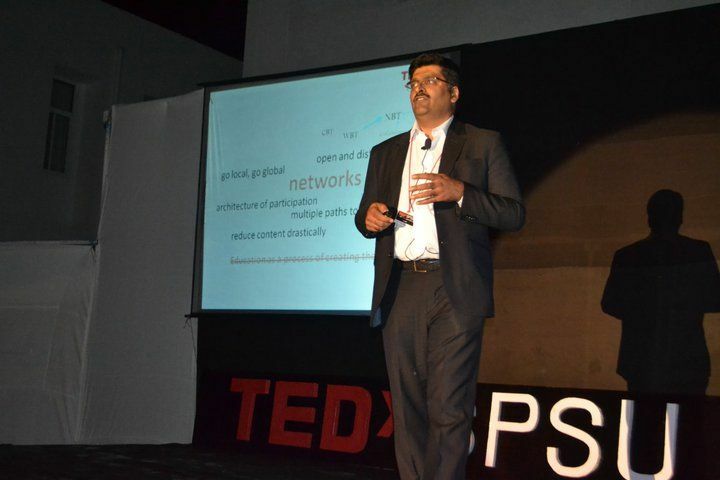 TEDxSPSU was held on March 12, 2011 at Sir Padampat Singhania University, Udaipur, India, with theme Order from Chaos. This series of posts are what my TEDx presentation was based on. There are six parts that shall be published sequentially over the next few days. This is Part Two. Why is it that our children are trained to lose every shred of empathy, curiosity, interest and creativity? It’s all very good to have a national policy on education that promotes critical and creative thinking and all that great stuff. It’s great to recognize the impact of technology in education. But on the ground, this translates into the ability to orient and train teachers to bring in these skills, to build the infrastructure to support the development of these skills and attitudes in students and to align these developments to what we need as a society, as a culture and as an economy. Curriculum designers could tell you that if they were to put every little bit of detail in the textbook, it would grow too large to handle in the time they had to teach the children about Gandhiji and the Dandi March. As it is, there is so much to cover and such little time. If you were to look at the curriculum, you would find that the average topic of instruction does not allow for more than an hour or so of average classroom time per topic. And this includes reading the book, explaining segments, answering questions, giving homework etc. In case you are wondering if I have made the transition to an under-graduate class in Political Science that would be slightly incorrect. 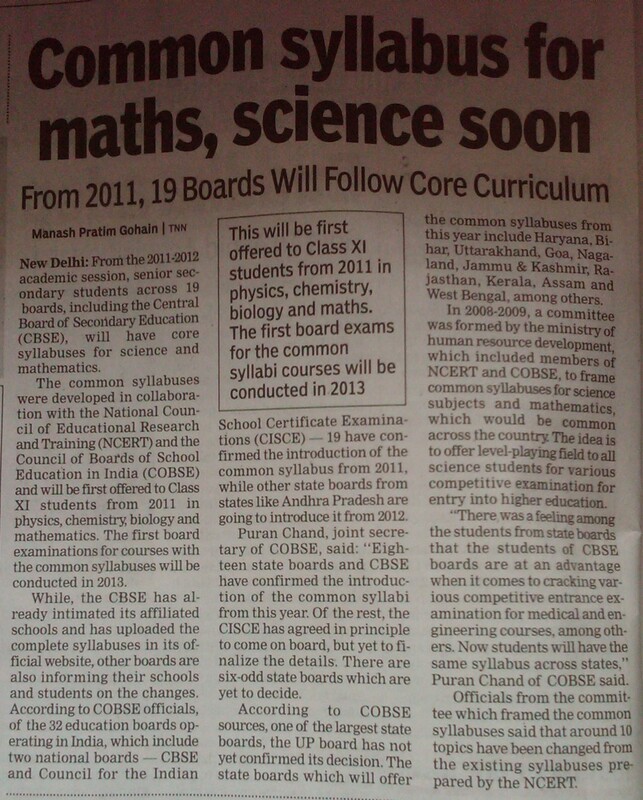 This is part of the Central Board of Secondary Education (India) curriculum on Social Science for Class IX. For some people, this would perhaps take a lifetime to discuss. So one would say, we don’t want a PhD thesis in class IX, just want the salient/critical points for them to learn about. What in effect we are saying then is that we do not want understanding, but an ability to repeat the writer’s belief in specifically those words that the writer has penned down. Not only that we will assess how closely the answers match with these words because our teacher may not know how to handle a perspective not expressly recorded in the book. No guesses on which answer will get you marks in the exam. TEDxSPSU was held on March 12, 2011 at Sir Padampat Singhania University, Udaipur, India, with the theme Order from Chaos. This series of posts are what my TEDx presentation was based on. There are six parts that shall be published sequentially across the next few days. This is Part One. I would like to begin with a personal anecdote. My daughter, Pari, is eleven and like other grade V children, she studies something called History. She is learning about the Indian Freedom struggle and the role Mohandas Gandhi and others played in it. Her book has some interesting facts, biographical and historical, about what Gandhi did and that his philosophy of non-violence is so important. We came to learn about the great Dandi March. Gandhiji decided to walk from his Ashram in Sabarmati, near Ahmedabad in the western state of Gujarat to the shores of the Arabian Sea to a place called Dandi. He went there to produce salt from the sea. In doing so, he violated the law through which the colonial powers, who had the monopoly on salt, imposed taxes on the purchase of salt. The book tells us it was over 300 kilometers away. While reading this, I was struck by a question I had never asked before. And perhaps many of you have not either. I wondered how old Gandhiji was at the time of this march. Well, the book tells us he was born in 1869, so that should make him over 60 at that time. Why would a 60-year old frail man WALK all the way to Dandi, 300 kilometers away when there were easier modes of transport available? The book talks factually about the march. The book states that he followed a philosophy of non-violence. But the book does not answer my question. Gandhiji undertook to walk because, on his way he wanted to spread the messages of the freedom movement, enlist followers for the breaking of the Salt Law and put pressure on the British government. It took him about 25 days to reach Dandi and he personally addressed over 50,000 people across 40 towns and villages in that time. 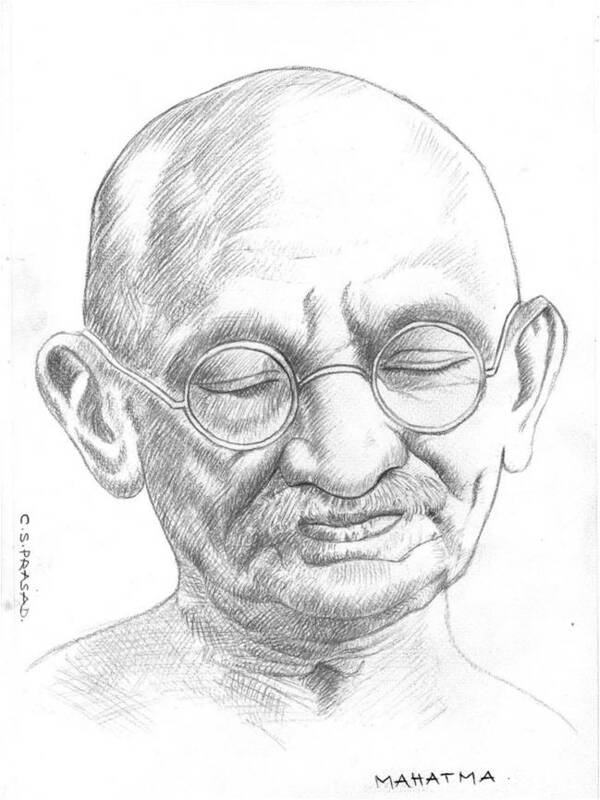 Gandhiji’s method sparked off a nationwide movement which extended to nearly 5 million people at over 5000 sites. The Dandi March of 1930 was an act of defiance against the colonial powers. The Salt Tax contributed to over 8% of tax revenue. Gandhiji cleverly chose Salt because he realized how common and necessary it really was. Faced with Gandhiji’s announcement to produced salt from the sea, the Viceroy then, Lord Irwin, said “At present the prospect of a salt campaign does not keep me awake at night”. As I researched it further, I found it was not an ad-hoc choice. It was a choice carefully deliberated from among competing options. A full strategy and the combined might of all the leaders was employed to galvanize the nation. Massive preparations were undertaken prior to the actual start of the March, designed for maximum impact. Nor was it the end of the road. There were carefully thought out actions at the end of the march – a lot of if-then scenario based planning. But hold on. The textbook mentioned nothing of this passion, strategy, ingenuity and determination of Gandhi. It tells us nothing really to substantiate why Gandhiji was famous for his non-violent principles. Which famous architect of the Indian Freedom Struggle was born in 1869?